JEFFERSON CITY, Mo. – The Missouri Department of Conservation urges drivers to be cautious on the roads this spring and give turtles a brake. These reptiles are often hit by cars during the warmer months, but are at special risk this time of year because they are more active. Common turtles spotted crossing Missouri roads include three-toed box turtles, ornate box turtles, and snapping turtles. Turtles emerge from their burrows and begin the hunt for food and mates during warm and wet conditions, which can lead them to cross roadways, oftentimes resulting in their death. Thousands of box turtles are killed every year by vehicles. 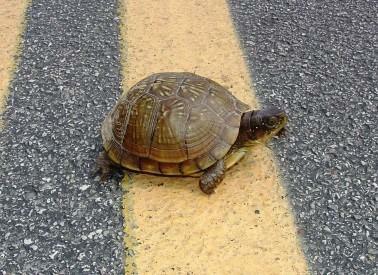 Vehicles are one of the leading factors in box turtle declines, and MDC urges motorists to be cautious and slow down when they see a turtle in the road. If helping a turtle make it safely across, check for traffic and move the turtle across the road in the direction it is traveling. Additionally, MDC encourages Missourians to leave turtles in the wild. Taking a wild animal, be it turtle or other wildlife species, and keeping it as a pet normally ends in a slow death. Leave turtles in the wild, follow the speed limit, and keep your eyes on the road. DID YOU KNOW: Most Missouri turtles can live up to 30 years, but the common box turtle can live up to 80, occasionally living more than a century. For more information on Missouri’s turtles, visit the MDC online Field Guide at nature.mdc.mo.gov/discover-nature/field-guide/search/turtle. MDC encourages drivers to be on the lookout for turtles on the road. Turtles emerge from their burrows during spring and often cross roads in search of food and mates.